The African fish eagle (Haliaeetus vocifer) or the African sea eagle is a large species of eagle. It is found throughout sub-Saharan Africa where there are large bodies of open water with plenty of fish. It is the national bird of Zimbabwe, Zambia and South Sudan. As a result of its large range, it is known in many languages. This species looks a bit like the bald eagle. They are related, but live on different continents. The bald eagle lives in North America. ↑ IUCN Red List 2013. ↑ Etymology: Haliaeetus, Modern Latin for "sea eagle". vocifer, from Latin vox, "voice" + -fer, one who bears something, in allusion to the conspicuous yelping calls. These are, when sitting, given with the head fully thrown to the back, a peculiarity found among sea eagles only in this and the Madagascar species. 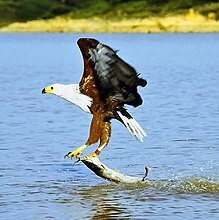 ↑ "African Fish Eagle (Haliaeetus vocifer) - Birds.com: Online Birds Guide with Facts, Articles, Videos, and Photos". Birds.com. Retrieved 2012-12-12. This page was last changed on 8 March 2016, at 17:14.